This Record’s No Good No More – a subsidiary of Crate-Digging, Inc. A periodic column where I turn a critical eye on records I liked once, but now find hard to get excited about. It’s really too bad. The emo ship sailed – it ceases to interest me. And that’s why I feel bad about feeling bad about Karate – there’s not a whole lot for me to get down on when it comes down to it. In fact, it’s not really Karate’s fault that I’m not digging Bed Is in the Ocean – it’s my own. I guess I grew up a little bit since I was into the whole emo thing. I stopped crying in my beer. Geoff Farina’s crew had carved a unique niche into the scene by the time Bed dropped in 1998, coelscing their sound over their two previous releases – 1996’s self-titled debut and 1997’s In Place of Real Insight – into a taut, math-inflected Chicago post-punk sound that fit equally on bills fronted by Tortoise and Slint as well as Seam and June of 44. They drew inspiration from jazz and blues traditions and were known for their attention to detail, both on record and in their live performances. Although Bed’s follow-up, 2000’s Unsolved, as well as Farina’s solo work, showcased the non-rock elements a bit better, the band’s evolution to this point hinted at experimental directions outside of traditional pop and punk styles. 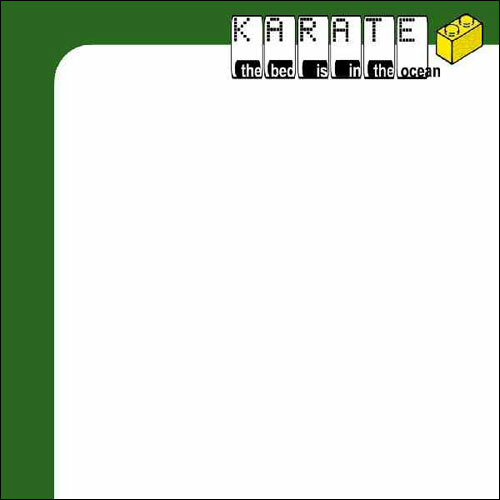 In short, Karate could get a little jazzy. All of which was just fine – the band was an acquired taste and operated with the DIY approach the American Midwestern indie scene was known for. Not a lot of people were into them, that I knew of anyway. They were from Boston – I didn’t listen to a lot of bands from that region (or New England, really). They were on Southern Records, a bastion of all things indie/emo in the late 1990s. I liked their name. I met a cute girl who asked if I liked them. All of these things added up to completely turn me on to the band. Perhaps if it was used more sparingly. Unfortunately, it’s the nature of emo bands to push that voice, the one that prioritizes emotion rather than range, no matter how much it grates the ears (or how cloying the delivery is), to the front. It’s so much less palatable to me these days. Either that or I’m much more picky when it comes down to it. (I praised Cap’n Jazz’s Analphabetapolothology, at any rate – I guess I haven’t written off the style completely.) It’s just that in the grand scheme, I’ve found records that are much better indicators of emotional intensity, self-discovery, and artistic boundary-pushing, such as Future Islands’ In Evening Air, Women’s Public Strain, and the Sunset Rubdown catalog, not to mention more abstract expressions such as Forest Swords’ Dagger Paths, Roncatto Braathen’s Be Quiet or You Will Expode into Fires, and even D Yellow Swans’ At All Ends. I’m not saying that any of these artists are technically better than Karate – I’m just saying I’d much prefer to listen to any of these over Bed Is in the Ocean these days. Actually, those and a whole long list of others. See ya, Karate. I appreciate your impression of the record, I respectfully disagree and believe this record is more communicative both structurally and creatively than any of the bands you find attractive. hey man, thanks for the “agree to disagree”! actually, this record came out when i was in high school, and i was really into this scene at the time. i’ve simply moved on. i hear you on the “i personally do not enjoy many records that have been praised in recent years” comment – me too! but if you’ll look in my archive, i HAVE been very generous to karate’s peers such as june of 44, dianogah, and cap’n jazz. you should read those, and if you haven’t, check out those records. anyhoo, thanks for reading! Everyone is entitled to their opinion but Karate is not ’emo’, that’s a fact. I guess everyone is entitled to their opinion!